On June 17, Soarin will officially see its new film debut with Soarin’ Around the World, but for those who want to take their farewell flights and experience the original film one last time, you will now be able to do so! The classic Soarin’ film will be available for Guests to experience at The Land Pavilion in Epcot for a limited time starting on May 27 through June 16. Guests may book FastPass+ reservations to experience the classic film one last time beginning May 21. 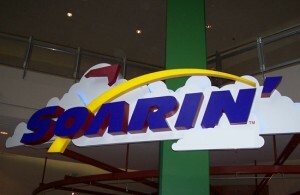 In addition, at Disney California Adventure, Soarin’ Over California will be showing now through June 15. For those unaware, when Soarin’ Around the World official debuts will take Guests to unique locations across the globe including the Great Wall of China, the Eiffel Tower in Paris, the Sydney Opera House in Australia, and more. Ok, let’s review, that is seat, seatbelt, carry-on items, safety strap, fear of heights, keep your hands and arms inside at all times…anything else? Oh yeah…have a nice flight on classic Soarin’ one last time! Has there been any news on the new version’s music/score? Same? New? Updated versions of original? Soarin’ Around the World will include a musical score, composed by Bruce Broughton, based on the original Soarin’ score by the late composer Jerry Goldsmith, and performed by the London Studio Orchestra. Any idea of the FP+ tier for this?